Pherson Associates was founded in 2003 by Chief Executive Officer Katherine Hibbs Pherson and President Randolph H. Pherson in response to requests for analytic, instructional, and management support from the Intelligence Community. Our services include workshops, courses, and consulting over a full range of analytic activities, including building models, frameworks, and processes; collecting and arraying critical data; developing and applying analytic tools and techniques; honing writing and briefing skills; publishing books and pamphlets; and maximizing the analytic power of the individual, the group, and the organization. Analytic Training: Pherson Associates offers open enrollment, customized courses, and workshops on analytic tradecraft, counterterrorism, critical thinking, counterintelligence, denial and deception, homeland security, risk analysis, and analytic writing and briefing. Leadership Development and Coaching: Pherson Associates helps employees at all levels improve their leadership skills by increasing their awareness of their talents, strengths, and opportunities for development, allowing them to overcome barriers to higher performance. Our ICF-certified coaches are able to administer most industry-standard personality and behavioral assessments. Workshop Facilitation: We have extensive experience in facilitating workshops, strategy sessions, and conferences for government and non-government personnel. We can provide experienced facilitators for your events and design customized agendas and programs for specific needs. Analyst’s Bookshop: Pherson Associates’ subsidiary Globalytica has curated a collection of analytic and critical thinking publications to provide one-stop shopping for educators, students, and intelligence practitioners. 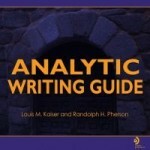 The Analyst’s Bookshop includes our popular Analyst’s Guide series and other key publications, as well as case studies that support the teaching of analytic techniques. Consulting Services: We provide a variety of consulting services to the US Government, private sector and the Intelligence Community in particular, including management support, mentoring, product review, and risk analysis. Analytic Tools: Pherson Associates, with its subsidiary Globalytica, has developed a toolbox of computer-assisted analytic tools and techniques for IC and private sector analysts.